Frankly, I don’t buy the ideas how one should splash on Valentine’s Day. The media is trying to coax you into believing that anything short of a romantic candle-lit dinner at a fancy restaurant with a dozen of roses is sub-standard celebration. The last thing you need is having to pay extra for the special occasion which costs lower on normal days. If you don’t intend to spend too much and being squeezed by creative marketers who are after your money, you still can have a wonderful Valentine’s Day without burning a hole in your pocket. All you need is some creative thinking. Or if you are lazy, steal some ideas from the Internet. I didn’t seriously think of how to celebrate this year’s Valentine’s Day until last Friday – 3 days before the day itself. Having children around when celebrating Valentine’s Day can make a world of difference. I started to throw ideas with J on Friday morning after telling her that I wanted to get suggestions on how to celebrate Valentine’s Day with her mother. However K was not around and he was still in school. Initially, we wanted to do it on the actual day but later we changed our mind. We did it on Friday due to some reasons. First reason, J did not go to school last Friday because it was a holiday for her school. We had more time to prepare for a special dinner since I didn’t have to fetch her from school that day. Secondly, my beloved wife came home late that evening due to her weekly badminton session. Even more time for us to get ready. Another more important reason, Friday was not the actual day and the probability of creating a surprise was unexpectedly high. Besides ownership of the event, another reason why I involved my children in coming up with ideas and celebrating this every-lady-seems-to-think-it-is-a-highly-important day, is no matter how bad my idea is, my wife would have toned down her criticism (not that she is a critical person to begin with) because of the kids’ involvement. A foolproof way to protect myself from being fried. The plan was like this: First we cook up an other-than-usual dinner which consists of main dish, dessert, and drink. We want to give my wife a surprise. So when she reaches home, we would ask her to stay in the living room and not allowed to enter the dining area until everything is ready. Once we decided what to have for dinner, I wrote down what we needed on a whiteboard with some help from J and K (K was already home from school then) – indirectly teaching the kids how to plan. Then we went to a nearby grocery store to get what we needed. J and K were in charged of preparing placemats. I would be responsible for cooking. To make things easy, I did my best to make use of what we had at home. Since I bought a tapioca root (meant for other purposes, not Valentines’ Day) two days before, I thought of using it for dessert. 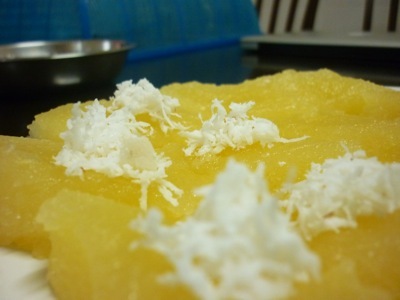 After a quick Google search, I found a steamed tapioca recipe that was different from what I intended to make. I thought it was a better idea so I gave it a try. Partly also due to simple ingredients needed for the dessert. 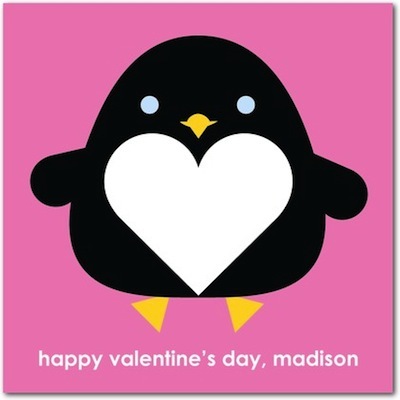 Since it is all about love on Valentine’s Day, heart-shaped objects are unavoidable. I tried to make as many heart shapes as possible. 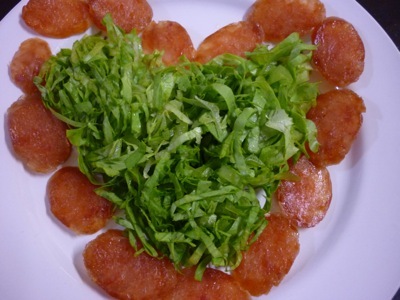 After thinking hard, I planned to make a big heart shape by using Chinese sausage and lettuce (again, all these ingredients were available in my refrigerator). 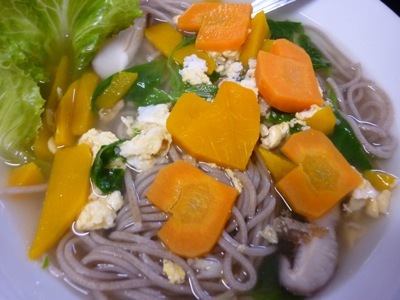 For main dish, I prepared Japanese soba noodle soup. This healthy meat-free dish came with heart-shaped carrots and pumpkin sprinkled with ground flax seeds. For drink, I made ice honey lemon. One thing I always remind myself is we should celebrate love any day of the year and not only on Valentine’s Day. The best is to do it on random days and during the most unexpected moments. And as you can see, it can be very economical to do so. When Valentine’s Day came, I made an e-card for my wife – using a customized photo that we took during our Japan trip. This process is made amazingly simple if a Mac is used. Note: Murphy’s Law came visit that evening. Half way through my cooking, I ran out of gas. Since it was still early, I thought I had ample time to order a new cylinder of gas. But the delivery guy was never in sight even after an hour (he promised to get it delivered in 30 minutes). Leaving me with no choice, I had to drive out and pick up a new tank of gas myself. It was a close shave. Fortunately I was almost done when my wife came home. Thank goodness our plan was somehow on track despite the last minute glitches.